This is a guest post from Kira of Penny Foolish. If you like what you see here, please consider subscribing to her RSS feed. My coworker brought in her brand new puppy for Monday and Tuesday, since temporarily there was no one at home to watch her, and I instantly had adorable-thing jealously. She was a really sweet puppy, and when she went home Monday I was quite anxious for her to return on Tuesday. Getting to play with this tiny creature instantly reignited the I Want A Dog desire which had been relatively dormant since I left for college. Nothing else with a backyard was in our price range, however… So the dream of having a dog had to die. But if I was really dedicated to getting a dog, what would it have cost me? Well, I suppose we could keep a dog in our apartment. No one in our complex hasone, but some people in the all 1 bedroom apartment complex kitty corner to ours have small dogs. But having a dog is in a small way like having a child – it’s not the cost of actually feeding them, but the incremental costs of providing enough space for them. So realistically we would have had to get a bigger place, and in a high demand area like ours, that would have come at a price. Probably at least $200 more per month (right now we pay $695, which includes $10 a month for the cat.) And then the cost of the dog itself, which from the shelter would be about $75, and then its initial shots, probably another $75. Food and toys every month, let’s say $25. I think we could definitely swing the monthly cost of the food and toys, and vet bills, and the initial cost of the dog, And I’d need to build up the emergency fund since there is now another member of the family who may have an emergency. But what would really kill my budget would be the extra cost of the apartment. Because not only would Boyfriend and I be paying $900 a month for the place, but we’d have higher electricity and gas to heat and cool it (extra $50 a month, perhaps), and probably need to fight for a place to park, which Boyfriend would hate intensely. (Free off street parking is relatively rare in our area.) To get a place with a large enough backyard that was still in our price range, we’d definitely have to compromise on the distance to work – and right now, since I walk to work, I’d have to buy a car and drive to work. So another $300 a month there (conservatively.) Plus a parking pass for once I get to work, another $40 a month. I’d probably be taxed more since we might have to live outside the city, in one of the higher-tax-levels suburbs. So all told, the direct cost of the dog over a year would be about $450. Indirect cost? More than $7, 000. If I had an especially large dog that needed a larger backyard, even more. Looking into the future, I’d have to continue paying these higher expenses for the life of the dog – and if I decide to move to DC or San Francisco or something like that, probably more than $100k over the life of the dog since it would cost an arm and a leg to rent a place with a big backyard near the city. So if I had a large dog, I might not be able to accept future job offers in expensive cities, and thus limit the arc of my career. And you can’t forget the opportunity cost of all this. Having to spend the money now means I won’t save it – therefore I can’t stick it in my IRA or spend it on a house. And having to wait five extra years to buy a house, or a significantly lower balance in my retirement accounts, is a huge drag on achieving my financial goals. Keeping our living situation simple (and backyard-free) until I can afford to buy a house anyway is probably the best bet, I think. Maybe I’ll just borrow my coworker’s puppy…. Adopt a greyhound! Larger dog, very happy in an apartment, sleeps 90% of the time and incredibly sweet. Taking it to a dog park or fenced in location once a week or so for a run should keep it happy. I’ve seen a similar phenomenon. My aunt and uncle are virtual prisoners of their dogs. Not only can’t they consider moving to someplace where she could earn a lot more money, but they can barely even travel, unless they do it seperately so one of them can stay behind with the dogs. 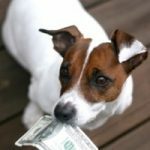 I wrote a similar post last week on the initial cost of my dog. His ShelterCare kicked in and I got $275 back, but the total cost is over $1000. (including food, obedience school and most recent treat purchases). I have had him a month and a half! !